The last Chicago cop facing disciplinary action in the David Koschman case has been paid more than $37,000 for overtime while assigned to desk duty as he fights City Hall’s efforts to suspend him for a year. That’s despite Sgt. Sam Cirone’s key role in one of his department’s biggest scandals, in which a nephew of former Mayor Richard M. Daley escaped being charged for a decade in Koschman’s death. Altogether, Cirone, 49, has been paid more than $225,000 in wages, overtime pay and other compensation since being put on administrative duty in February 2016 pending disciplinary action, records obtained by the Chicago Sun-Times show. In addition to his regular pay, he got $27,941 in “generic overtime,” $20,767 for 400 hours of compensatory time he had accumulated, $9,301 in supervisor’s overtime, $8,306 for vacation and personal days he cashed in, $5,235 for “duty availability” pay and $2,400 for his uniform allowance. The second-generation Chicago cop — his late father was a detective — is the last of six officers facing punishment for their handling of the 2011 re-investigation of Koschman’s death. Four have left the department, and one has served his suspension. Cirone has been on administrative duty since John Escalante, the city’s interim police superintendent at the time, recommended he serve a year’s unpaid suspension for his role in closing the investigation of Koschman’s death without charging his attacker, Daley nephew Richard J. “R.J.” Vanecko. Cirone is on desk duty at Area North. He supervised the two detectives who re-examined the Koschman case in 2011 and closed it without charging Vanecko. Sun-Times reporting on the case led to the appointment of a special prosecutor and Vanecko ending up in jail for two months for involuntary manslaughter. Besides charging Daley’s nephew, the special prosecutor, former U.S. Attorney Dan K. Webb, also found that 2011 police investigation was so badly mishandled that he considered filing criminal charges against Cirone and five other cops for official misconduct. He said he didn’t because he didn’t think he had enough evidence to convict them. Mayor Rahm Emanuel then had City Hall Inspector General Joseph Ferguson conduct a separate investigation. Ferguson issued a report on Dec. 4, 2015, urging Escalante to fire Lt. Denis P. Walsh and detectives James Gilger and Nick Spanos and to consider punishments as severe as firing for Cirone, Chief of Detectives Constantine “Dean” Andrews and Cmdr. Joseph Salemme. Regarding Cirone, Ferguson found that the two detectives, working under his command, failed to conduct a thorough investigation and submitted a final police report that relied on a made-up witness statement to justify closing the case in March 2011 without charging Vanecko. Escalante filed disciplinary charges against Cirone with the Chicago Police Board, asking it to suspend him for a year without pay. A week later, Cirone filed a union grievance, arguing that the city waited too long to punish him over the 2011 report. “This delay of more than five years is unreasonable and prejudicial to my ability to defend myself,” Cirone said in the grievance. George Roumell, the arbitrator who heard Cirone’s case, ruled against the city. City Hall argued that state law and city ordinances say the police board has to rule on all suspensions of 30 days or more. But Roumell ruled the union contract allows sergeants facing suspensions of at least 11 days to have their cases decided by an independent arbitrator, rather than the police board, whose members are appointed by the mayor. The police board also has the power to issue a harsher punishment than what’s recommended, including dismissal. Before it got a final sign-off, the sergeants’ proposed contract said cases involving recommended suspensions of “11 to 30 days” could go to an arbitrator, records show. But, during negotiations, someone changed the language to say sergeants could seek arbitration for any suspension of at least 11 days. That change was apparently signed off on by Donald O’Neill, who was the police department’s director of human resources and helped negotiate the contract, records show. O’Neill now works for the city law department, which hasn’t responded to requests to interview him. The union sued to block the police board from taking any action against Cirone, and Cook County Circuit Judge Anna Helen Demacopoulos ruled in April in favor of the union and Cirone. The police board put its hearings against Cirone on hold while the Emanuel administration appealed. It’s awaiting an Illinois Appellate Court decision on Demacopoulos’ ruling. The union’s contract expired a year ago. But it remains in effect until a new contract is signed. The lawsuit filed by the union that represents Chicago’s 1,100 police sergeants also has blocked the police board from acting on Supt. Eddie Johnson’s request to suspend Sgt. Jack Axium for 270 days. Johnson says Axium referred to Obama as a “n—–” at the 12th District police station on Oct. 27, 2015, when the president was in town for a visit. Axium remains on duty. Meanwhile, Cirone, who has an MBA from Northwestern University, is on administrative duty in the detective bureau at Belmont and Western, awaiting punishment — either by the police board or an arbitrator, depending on how the appeals court rules — and earning overtime. 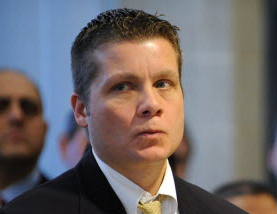 Of the Koschman cops the inspector general sought to punish, Escalante agreed to fire Walsh and Gilger but handed out one-year suspensions to the rest. Andrews, Gilger, Salemme and Walsh escaped any disciplinary action by retiring. They’re now collecting police pensions. Cirone and Spanos weren’t old enough to retire. Both remain with the department. Even though Andrews, Gilger, Salemme and Walsh all left the city payroll at least 18 months ago, the city has paid them a total of nearly $400,000 since then, mostly for compensatory time and vacation they were owed. That’s in addition to their pensions. Constantine G. “Dean” Andrews, left, with then-Supt. • Andrews, the highest-ranking cop who faced disciplinary action in the case, began collecting his $106,475 annual pension last year. The city also paid him $166,815 last year, including $133,336 for 1,496 hours of comp time accumulated over his career. Andrews, 52, now is a vice president for a Chicago property-management firm. • Salemme, who ran the detective bureau that oversaw the case, also began collecting his $117,696-a-year pension last year. Salemme, 57, has been paid an additional $158,837, including $148,774 for 1,934 hours of comp time. The city still owes Salemme $49,388 for nearly 600 hours of comp time. • Walsh, 54, who had missing Koschman case files at his home even though he had no official role in the re-investigation, is getting a yearly pension of $93,395. The city also paid him $110,968 last year, including $59,736 for comp time. • Gilger, 60, the lead detective on the Koschman re-investigation, began collecting his $72,704 pension last year. The city also paid him $73,698, including $37,993 for 783 hours of comp time. The city still owes him $25,987 for 535 hours of comp time. • Spanos, Gilger’s partner, got a one-year suspension from Escalante, who then allowed him to effectively cut the suspension to about two months by letting him take unpaid leave and cash in 1,400 hours of accrued time last year. Even with the suspension, Spanos, 46, still was paid $110,966 last year, including $19,392 in overtime. He made $75,439 the first six months of this year, including $22,622 in overtime. Escalante also gave Andrews and Salemme retirement badges known as stars, a coveted perk that’s supposed to go to cops who retire in good standing, not facing any ongoing investigations. They each got two stars. Andrews was given one as a retired lieutenant and one as a retired chief. Salemme got a retired lieutenant’s star and one as a retired commander. Gilger and Walsh didn’t, so they didn’t get retirement stars, Escalante says. Andrews and Salemme got their stars two months before Escalante acted on the punishments Ferguson sought for them. Gilger put in for retirement in February 2016, a few days before Escalante revealed disciplinary action in the Koschman case. Walsh retired a week after Escalante filed disciplinary charges seeking to fire him.